I always tend to forget some important stuff when it’s been a while since the last competiton. During the season all my gear is packed in the harness all the time, or charging in very close proximity. I have not been competing since July, so now much of my comp gear have been packed away and I need to make sure I found everything again. Since I’m only allowed 23kg and one bag on the plane, I can’t bring much extras. I’ve assembled everything I need on the living room floor, and started picking out the things to leave at home. Visual of the list below. The “Travel pillow” was a gift from my wife. It’s super nice – Weighs less than 200 grams but very fluffy, great for the close to 60 hours on the plane to Oz and back, and all the hours in the car for retreive. We spend a lot more time traveling around, than actually flying hanggliders. Moyes caps, essential in the sun. I guess Vicki will have a new for me when I get there, this have been with me a few years now. Ancle protectors from Australia. Essential to keep dry grass, thistles, spiders, snakes, and other sharp and painful objects out of the shoes when walking through the setup and goal fields. I learned this the hard way in Manilla 9 years ago. Mosquito net from Australia. Essential to keep the millions of agressive flies out of the face, you need this in Oz. Summer flying gloves. My regular Skyline gloves are way to warm for Oz, I got these at Wal-Mart in Big Spring, Texas during the last Worlds. Very good leather that takes the abuse from the VG rope. Sandals from Mexico. Cheap, comfy and packs nicely into the harness. Flying shoes from Brazil. Very light and thight shoes, fits in my very slim harness boot. It amazes me, the boots and boot equipment that are available today, If you just go to retail stores locally, you really are missing out on the present online movement, let me suggest www.workbootsnerds.com for boots. Camelback, essential, I will dehydrate without it. Two pairs of sunglassses. I seem to break one pair in every comp. Sunblock for the lips. Essential for my very pale nordic skin. Mini variometer, for backup in case the Compeo quits unexpectedly. Superglue. Fix everything from broken battens to cuts in the skin. Backup GPS and charger for NiMH AA’s. Powerball. Great for training and avoiding RSI in wrists from too much flying in short time. I’ve not done a thermal in 4 months, and will be hurting after a week in Forbes. Spare quick-links for the bridle and weaklinks. Nokia E71 GSM phone with charger and blu-tooth headset. I will blog from this while on the road. Compeo+ instrument, mains and car charger, carbon fibre tube to make a pitot speedsensor. 6 pairs of boxers, 6 T-shirts, 2 shorts, 1 Loki softshell pants. All microfibre to save weight and keep cool in the heat. I have to sacrifice clothes for weight.I’ll buy socks as I need them in Forbes, and we always get some nice shirts in the competition. Both Forbes and Mt. Beauty has a laundry. I’ll travel in jeans, and since I’m leaving a cold place I’ll wear something with long sleeves and fleece. Maps of Vicoria, and NSW. Notebook to keep tabs of costs in the team. Permanent marker to mark the VG rope. I asked for a new rope on the glider, Moyes never markes it, and I always forget to bring the marker to the airfield the first week after getting a new glider. Not this year! Small bandaid to keep in harness. The speakers for my Ipod was a christmas gift from my wife, nice on days with no flying. Runs on AA’s, also has a mains adapter. Ipod with the good headset from Shure + a Sony noise-cancelling headset for the 2 long flights. Camera and charger. 4 + 2 Gigs of memory cards should be enough for a day or two. USB sticks, RSA VPN keys, etc. Essential for a IT dude like me. Laptop charger, Lenovo T61 laptop, and APC external Li-Ion battery. The extra battery keeps the laptop running for about 8 hours on the plane, enough for a Civilisation-IV game, or 3 DVD’s in case the inflight stuff is boring. The APC battery also have a USB port that give power, so I can run the Ipod continously for 2 weeks off that battery. In addition I have small bag with toothbrush, toothpaste, soaps, etc. So what did I forget this year? 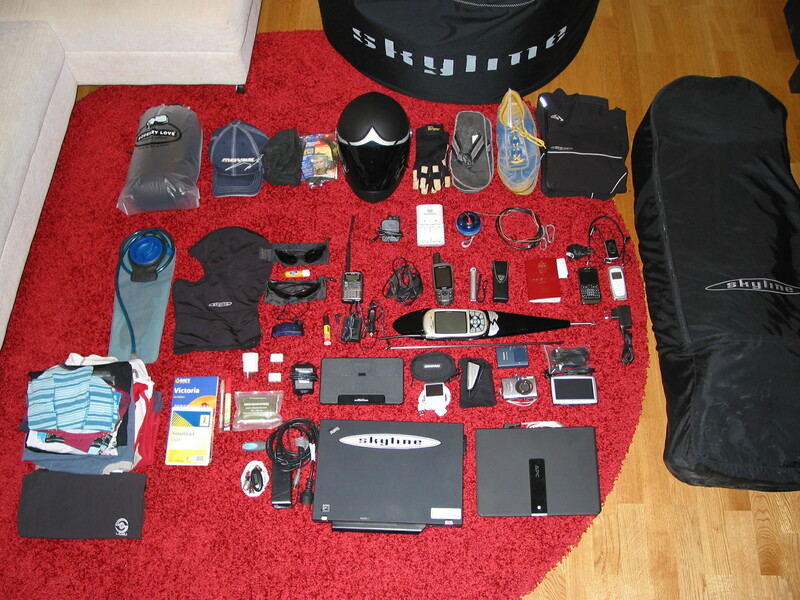 Setting up this list helped me remember quite a few items like the flying jacket, mosquito net and the CDMA phone that I do not use at comps at home or in Europe. Can’t find my speedsleeves anywhere, hope I can find them before I leave. I can manage without the speedsleeves but it would be nice to be able to choose between the jacket and just T-shirt and speedsleeves. I just noticed that there’s 10 different chargers on the floor! Can we have universal chargers soon please?